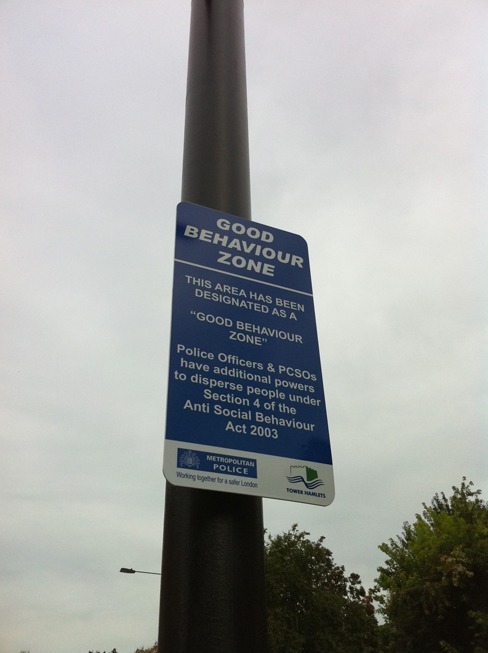 Signs and zones like this have proliferated across the UK since the late 1990s with New Labour's efforts to privatise and control public space by changing legislation. Labours introduction of anti-social behaviour legislation which aimed to improve people's behaviour, was part of a broader "Broken Windows", "Zero Tolerance" strategy - first implemented by the former NYC mayor Rudolph Guiliani in the early 1990s. It creates sanctions for low-level offences which are not actually criminal and gives greater powers to the police. Journalist Anna Minton explores these issues in her book "Ground Control; Fear and Happiness in the Twenty-First-Century City".